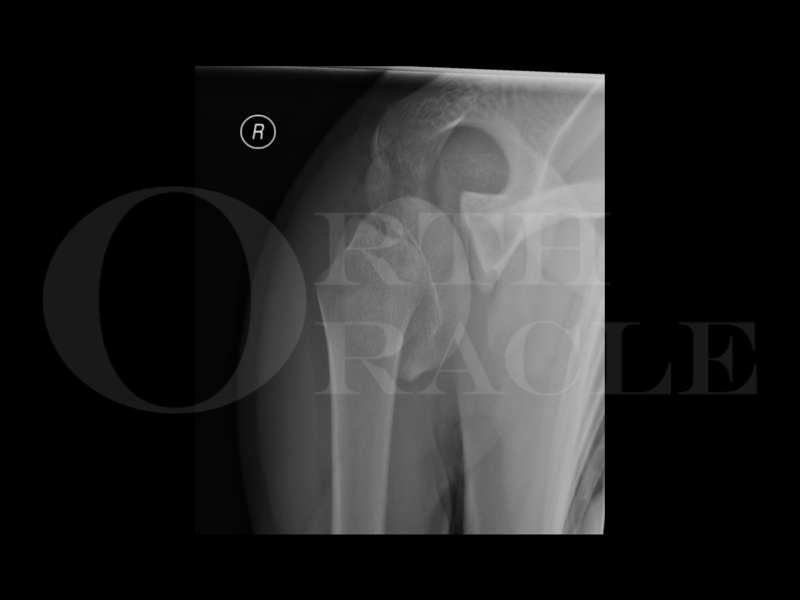 Learn the Open Reduction and Internal fixation of proximal humeral physeal fracture using Synthes Philos plate surgical technique with step by step instructions on OrthOracle. Our e-learning platform contains high resolution images and a certified CME of the Open Reduction and Internal fixation of proximal humeral physeal fracture using Synthes Philos plate surgical procedure. Proximal humerus physeal fractures are uncommon and account for fewer than 5% of fractures in children. They can be broadly divided into 2 types ,Salter-Harris I or Salter-Harris II . A Salter-Harris II is the more common injury and is typically an injury of adolescents following blunt trauma to the shoulder. A Salter-Harris I is more common in children under 5 years of age. Salter-Harris I injuries can occur as an overuse injury with resultant secondary fracture. Typically, a widening of the physis can be seen. Radiographic evaluation of the shoulder is performed with standard AP and axial or scapula Y views of the shoulder. Contralateral shoulder views can be requested for comparison. The combined views allow assessment of the severity of the displacement. The epiphysis tends to abduct and externally rotate due to the pull of the rotator cuff (supraspinatus and infraspinatus). The humeral shaft is usually displaced into a shortened, adducted and anterior position due to the pull of deltoid and pectoralis major. Anatomically, the proximal humeral physis contributes to 80% of humeral growth. It closes between the ages of 16-17 in females and at around 18 in males. The decision making is for type of fixation is down to a balance of providing a stable reduction without compromising growth potential. Where growth arrest is not a concern, a Philos plate would provide the most robust fixation as it provides adequate fixation in the epiphyseal and metaphyseal fragments. In descending order of stability, this is followed by cannulated screws, flexible nails and Kirshner wire pinning.